WASHINGTON, D.C. -- Fifty-five percent of Americans now support the Affordable Care Act (ACA), a major turnaround from five months ago when 42% approved and 53% disapproved. 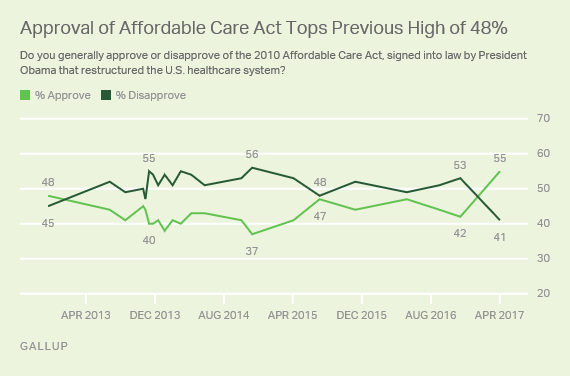 This is the first time a majority of Americans have approved of the healthcare law, also known as Obamacare, since Gallup first asked about it in this format in November 2012. Since the ACA's passage without a single Republican vote in its favor, the law has been a significant political issue in each of the past four national elections. Republicans' opposition to the ACA helped them win control of the House in 2010, control of the Senate in 2014 and the presidency last year. However, Republicans' plan to repeal and replace the healthcare law foundered last month, as House leaders' replacement bill ran into stiff opposition within the party. Republicans, Democrats and independents are all more likely to approve of the ACA now than in November, a few days after Donald Trump's victory in the presidential election left Republicans in control of the legislative and executive branches. Independents have led the way in this shift toward approval, increasing by 17 percentage points compared with 10-point changes for both Republicans and Democrats. When including "leaners" (independents who lean toward either the Republican or Democratic Party) in the totals for both major party groups, Democratic approval has increased by 16 points, compared with eight points for Republicans. 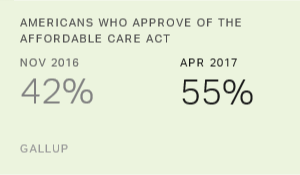 Although the ACA never garnered majority support in Gallup polling before this month, nearly half of Americans (48%) approved of it the first time the current version of the question was asked in November 2012. In response to a previous version of the question that asked whether Americans thought passing the healthcare law was a good thing or a bad thing, 49% said it was a good thing when the question was first asked in early 2010. However, support was a few percentage points lower each of the next two times it was asked. Though a majority of Americans now approve of the ACA, only about one in four (26%) want to keep it largely as it is. Forty percent want to keep the law in place but make significant changes, while 30% want to repeal and replace it. Would you rather keep the ACA in place largely as it is, keep the ACA in place but make significant changes to it, or repeal the ACA and replace it with a new healthcare plan? The differences in opinion between Democrats and Republicans on this issue affects their views on what action, if any, to take. Democrats are split on whether to keep the act largely as it is (44%) or keep it but make significant changes to it (47%). In contrast, a majority of Republicans (60%) want to repeal and replace the law. Twenty-six percent want to keep the law in place largely as it is. The 40% who want to keep the law but make significant changes are evenly split: 49% want Congress to continue to work on healthcare in the next few months, while 49% would like to see Congress turn its attention to other issues for the time being. Among the 30% who want the ACA repealed and replaced, most (64%) say Congress should continue to work on healthcare. 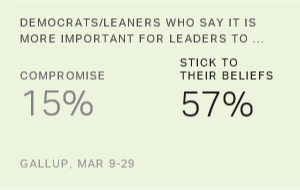 Another 32% say Congress should turn to other issues. Trump vehemently attacked the Affordable Care Act during his presidential campaign -- and in the days immediately following his election, the public appeared to agree with him. However, in the five months since, as Republicans' efforts to replace the law with one of their own have failed to get off the ground, enough Americans have changed their minds about the ACA to create a majority favoring it for the first time. If that majority holds, it would be a significant development. Politically, it creates a major obstacle to Trump and Congress' ongoing efforts to change or replace the law. In future elections, it could turn the GOP's opposition to the law from an asset into a liability. More importantly in the daily lives of Americans, it might mean that the most sweeping changes to the nation's healthcare system in decades will remain the law of the land for the foreseeable future. Results for this Gallup poll are based on telephone interviews conducted April 1-2, 2017, on the Gallup U.S. Daily survey with a random sample of 1,023 adults, aged 18 and older, living in all 50 U.S. states and the District of Columbia. For results based on the total sample of national adults, the margin of sampling error is ±4 percentage points at the 95% confidence level. President Trump's job approval rating has fallen four percentage points overall since early March, with declines evident among most subgroups, including a seven-point decline among men.